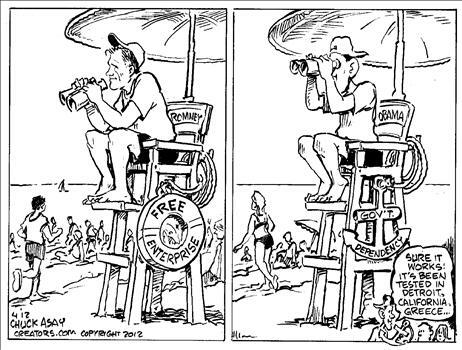 I periodically praise Chuck Asay for being a great political cartoonist. I’m not sure if my favorite is this one featuring the three little pigs, or this one showing why parasites shouldn’t kill their host animal. And you’ll find some other funny ones here, here, here, and here. But now I’m conflicted. Mr. Asay has a new cartoon that is really good and really bad. So I’m taking some liberties and showing the good part first (you get your ice cream before your spinach in this post). 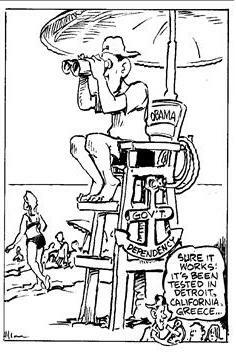 Needless to say, you don’t want Obama to be your lifeguard. The details of the cartoon are what make it so effective, including the characters in the lower right of the frame. And if you like the use of the anchor, here’s another cartoon that you’ll appreciate. It’s not by Chuck Asay, but it bashes the value-added tax, and that’s a quick way to get on my good side. So what’s the bad part of the cartoon? Well, here’s the full image. As you can see, Romney has a co-starring role, and it portrays him as a supporter of free enterprise. We should be so lucky. Romney is sympathetic to a VAT. Is that free enterprise? Romney criticized personal retirement accounts earlier in the campaign. Is that free enterprise? Romney supports corrupt ethanol subsidies. Is that free enterprise? Romney still says nice things about the TARP bailout. Is that free enterprise? And I don’t need to remind anybody about Obamacare’s evil twin. Is that free enterprise? The moral of the story is that red anchors are just as ineffective as blue anchors. I am not particularly a Romney fan, but I could name at least a dozen reasons to vote against Mr. Obama and support Mr. Romney. I don’t believe that sitting on the fence in this election is a good choice, either. I feel that either everyone becomes proactive in their choice and support or we will see this nation fail. There are only two viable choices in this presidential election. Man up and pick one, or stop your whining.